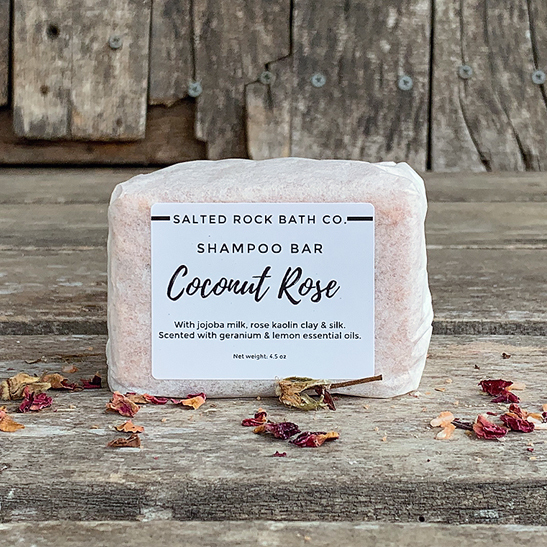 coconut rose shampoo bar – Salted Rock Bath Co.
Coconut Rose shampoo bars are formulated to be useful for most hair types, but are especially helpful for oily scalps and/or dry hair. It contains rose kaolin clay which helps absorb excess oils, but won’t absorb excess moisture which can lead to dry and damages locks. It also contains jojoba milk which hydrates, smooths and conditions . You can read more about the beneficial ingredients in this bar under the “benefits” tab. Find out why shampoo bars are one of the hottest hair products currently on the market. Not only are they fun and easy to use, but economical as well. Ditch the bottles and enjoy a salon quality shampoo that is super concentrated and will last up to 4 times longer than your normal liquid brand. Coconut Rose shampoo bars are formulated to be useful for most hair types, but are especially helpful for oily scalps and/or dry hair. It contains rose kaolin clay which helps absorb excess oils, but won’t absorb excess moisture which can lead to dry and damaged locks. It also contains jojoba milk which hydrates, smooths and conditions . You can read more about the beneficial ingredients in this bar under the “benefits” tab. 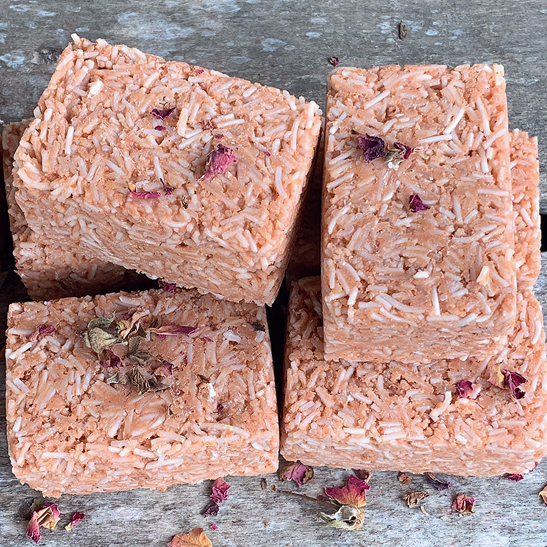 This bar is scented with a pure essential oil blend of geranium rose with a dash of lemon. Great for all hair types, but especially helpful for those with oily scalps or dry hair. Ingredients: Sodium Cocoyl Isethionate, Sodium Lauryl Sulfoacetate, Coconut Oil, Behentrimonium Methosulfate, Cetyl Alcohol, Cocamidopropyl Betaine, Silk Amino Acids, Panthenol, Jojoba milk, Rose Kaolin, Germall Plus (Paraben Free Preservative) . Silk Amino Acids: Thought to easily penetrate the hair cuticle and the upper layers of the skin. Silk protein binds to the keratin in hair to treat damage and add a protective barrier that seals in moisture, making hair more manageable and less prone to breakage. Rose Kaolin Clay: Absorbs excess oils from scalp. Gently exfoliates while stimulating circulation and cleansing. Panthenol: (Vitamin B5): Thought to penetrate the hair shaft, and help to improve moisture retention. Jojoba Milk:: Used for its smoothing and conditioning properties. Thought to thicken and strengthen hair. Nourishes scalp and is thought to help remove build-up from hair follicles.